Choose to pacify or kill, target multiple enemies at once with the new dual-target system, and shoot with one hand while suspended with the other. 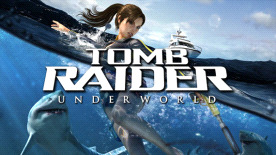 Tomb Raider: Underworld © Square Enix Ltd. 2008-2012. Developed by Crystal Dynamics Inc. Published for the Mac by Feral Interactive Ltd.  Tomb Raider, Tomb Raider: Underworld, Crystal Dynamics, the Crystal Dynamics logo, Eidos, and the Eidos logo are trademarks of Square Enix Ltd. Square Enix and the Square Enix logo are trademarks or registered trademarks of Square Enix Holdings Co. Ltd. Mac and the Mac logo are trademarks of Apple Inc., registered in the U.S. and other countries. Feral and the Feral logo are trademarks of Feral Interactive Limited. All other trademarks are property of their respective owners. All rights reserved.